When I was yet a very young woman I threw my heart away. I fashioned a wee coracle of leaf and willow twig and reed, a coracle that sat in the hollow of my two palms. In this I placed my wounded, wretched heart and set it adrift on the rain-misted wavelets of the Fey river, and I watched it bob and whirl, sail and sink. What vocabulary…what imagery…what a marvelous way to re-imagine Arthurian legend. For within the pages of Merlin’s Harp we find all the well-known characters: Arthur, Merlin, Morgan Le Fay, Mordred, Gwen, and Lancelot. But, they are interspersed with the fey, fairy creatures with even-fingered hands and magical gifts. The story is told through the eyes of Niviene, a winsome lass who meets Arthur while he is hunting the white deer. Their union produces Bran, who could have been raised by Merlin and brought up in royal surroundings. But, when Bran leaves his mother as a young child, she throws her heart away. The rest of the book tells us of Niviene’s call by Merlin to save Arthur’s kingdom from the Saxons, and we are pulled into the story by Anne Eliot Compton’s magical writing, her magical rendering of this beloved tale. 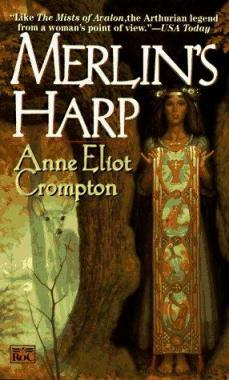 Read Chapter 1 of Merlin’s Harp here. I'm glad you enjoyed it, but I'm not sure the mix of fey and Arthur would work for me. That's what I thought at first, too, Bermuda Onion. But, the writing is of such top quality you don't even become annoyed by the little 'fairies', who are actually more substantial than that. I like the first chapter. The writing is beautiful. And I haven't read a King Arthur story for a while! I do so love these legends! There is so much packed into that story: Lugh, Nimue, Merlin…I'll look for this one, Bellezza. Have you ever dipped into Robert Graves' The White Goddess? It's a sort of anthropology of myth, especially Celtic myth. Anyhow, thanks! I love legends, but I am pretty funny about what sorts of things the writer includes. And the cover is a big turn-off to me. It's pretty but just screams sci-fi, and it sounds as though it's better than that. (Ok, I'm showing my prejudice against sci-fi, sorry! I just have read more bad sci-fi than good – although the good is really really good).And ds, I love love love Robert Graves. What a genius. ds, I'm not familiar with Robert Graves (in name only) so thanks for the recommendation for The White Goddess. I'll look that up coming from you! I agree about the cover looking, well, just plain silly. There's a cover from the UK which I was going to post as well, but changed my mind at the last minute, which looks much more serious; it reflects the writing more than this particular cover does.Thanks for seconding Robert Graves! I, Claudius. If you haven't read it, do. I happen to really like Roman history and mythology, but you seem to have similar taste. ds has me curious about The White Goddess now.I'm fascinated with book covers. I like to play around with design, so I'm pretty harsh when I see ones that just don't seem to translate well. Wow, what a first line. That is some magical writing. I'd definitely be interested in reading this book. Last year, I did some research on faeries for a medieval literature class and since then I have been pretty obsessed with the magically mythical creatures. This sounds like such a beautiful book. I can't get enough of Arthurian retellings, especially ones that bring something new to the old beloved stories. Isn't it wonderful when you open a book and find such beautiful prose? I love Arthurian legends, although I must confess I haven't read Malory's 'La Morte d'Arthur'. Have you?